Burlyn Andall-Blake celebrates her first 5K at the Percy Sutton Harlem 5K Run in August. Seventeen-year-old Burlyn Andall-Blake is ending the year on a high note: She just finished submitting all of her college applications and can now dedicate more time to the app she’s developing—it provides resources to victims of domestic violence, human trafficking, and sexual assault. 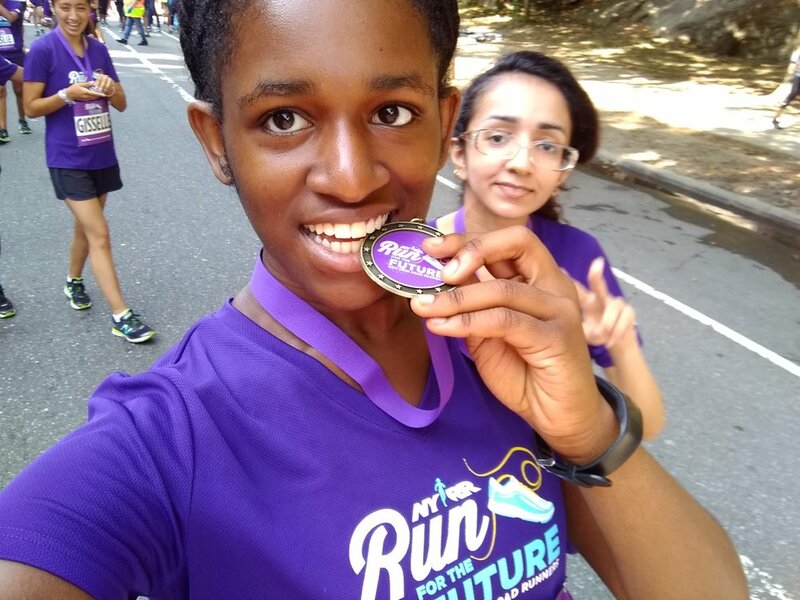 Burlyn’s passion for helping others—and her motivation to succeed—made her the perfect candidate for NYRR Run for the Future, a free summer running program that introduces high school girls to the sport. Along with support and guidance from NYRR’s coaching staff, Run for the Future participants have access to workshops that teach the new runners about running technique, nutrition, form drills, and stretching. The program also helps young women develop healthy body image and encourages them to set goals for themselves. “It gave me courage to get into new endeavors,” says Burlyn, who’s not just seizing new opportunities at school—like creating an app—but also in her running. Burlyn ran her first race at the 2017 Percy Sutton Harlem 5K Run in August as part of a group of 85 Run for the Future participants. Each young woman completed the 3.1 miles alongside a race buddy, an experienced runner who offers motivation, guidance, and pacing throughout the race. Among these race buddies was Olympic silver medalist and NYRR Team for Kids Ambassador Shalane Flanagan, who would go on to win the women’s open division at the TCS New York City Marathon on November 5. Burlyn went on to win third in her age group at the 2017 Kurt Steiner Cross Country 5K in September. Today, she continues to run two to three miles twice a week, calling on the pacing and pre- and post-race stretching advice she picked up during Run for the Future sessions. Shalane Flanagan took part in the Percy Sutton Harlem 5K Run alongside 85 NYRR Run for the Future participants. As she stays focused on graduating high school this spring, there’s no doubt Burlyn will carry all that she’s learned from running—goal-setting, persistence, and the feeling of finishing something amazing—into her college years and beyond. Learn more about NYRR Run for the Future and how your support helps fund youth and community programs like this one.